A top-rated PBS KIDS series and online experience, THE CAT IN THE HAT KNOWS A LOT ABOUT THAT! introduces children to scientific inquiry skills, teaching core science concepts and vocabulary, and preparing preschoolers for kindergarten and first grade science curriculum — all in Seussian style. With a cross-platform approach, PBS KIDS is increasingly serving children and families across America wherever they live, learn and play. ABOUT THE CAT IN THE HAT KNOWS A LOT ABOUT THAT! THE CAT IN THE HAT KNOWS A LOT ABOUT THAT! was created in response to recent findings that children graduating from kindergarten are less prepared to learn about science than about other subjects. The series supports young children’s science learning by introducing scientific inquiry skills, teaching core science concepts and vocabulary, and preparing preschoolers for kindergarten and first grade science curriculum — all in whimsical style. A team of science and early childhood experts developed the curriculum for the series, each episode of which begins with a question posed by Sally or Nick. Although the Cat in the Hat knows a lot of things, his insatiable curiosity to learn more about the world leads to adventures with Sally and Nick in his one-of-a-kind Thinga-ma-jigger, a marvelously Seuss-ian contraption that sprouts wings, pontoons, booster rockets, skis and just about anything else needed to find the answer. The inquisitive gang travels to the bottom of the sea to observe giant sea worms, zips to the rain forest to visit animals living in kapok trees and shrinks to bee-size to visit a hive and learn how honey is made. Guided by the Cat in the Hat, the kids figure things out by observing, collecting and managing clues, making connections, constructing and evaluating theories and having discussions — all in a preschool-appropriate manner. 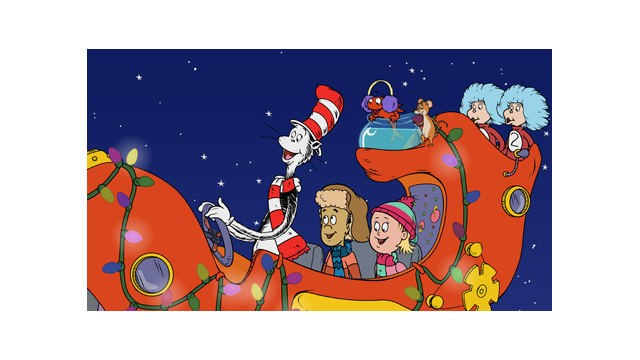 Produced by Portfolio Entertainment Inc. and Collingwood O’Hare Productions, in association with Dr. Seuss Enterprises, Random House Children’s Entertainment, Treehouse, and PBS KIDS, THE CAT IN THE HAT KNOWS A LOT ABOUT THAT! is based on Random House’s best-selling Beginner Book collection, The Cat in the Hat’s Learning Library. ABOUT RANDOM HOUSE CHILDREN’S ENTERTAINMENT, LLC Random House Children’s Entertainment, a division of Random House Children’s Books, is dedicated to expanding the reach of children’s stories beyond books to a variety of traditional and new media platforms. Drawing from the rich and varied library of books published by Random House, the company’s mission is to create, produce and distribute quality projects for young people that will educate, enlighten and entertain. Random House Children’s Books is the world’s largest English-language children’s trade book publisher. Creating books for toddlers through young adult readers, in all formats from board books to activity books to picture books, novels, ebooks and apps, the imprints of Random House Children’s Books bring together award-winning authors and illustrators, world-famous franchise characters and multimillion-copy series. Random House is also the longtime home of the beloved and best-selling Dr. Seuss books, which continue to make learning to read fun for millions of children everywhere. Seussville (http://www.seussville.com), the official home of Dr. Seuss on the Web, is the place for children of all ages to play and learn with Dr. Seuss’ wonderfully whimsical books and classic characters. Random House Children’s Books is a division of Random House, Inc., whose parent company is Bertelsmann AG, a leading international media company. ABOUT DR. SEUSS ENTERPRISES, L.P. The primary focus of the Dr. Seuss Enterprises, L.P. is to protect the integrity of the Dr. Seuss books while expanding beyond books into ancillary areas. This effort is a strategic part of the overall mission to nurture and safeguard the relationship consumers have with Dr. Seuss characters. Theodor Seuss Geisel (Dr. Seuss) said he never wanted to license his characters to anyone who would “round out the edges.” That is one of the guiding philosophies of Dr. Seuss Enterprises. Audrey S. Geisel, the widow of Dr. Seuss, heads Dr. Seuss Enterprises as CEO. ABOUT PBS KIDS PBS KIDS, the number one educational media brand for kids, offers all children the opportunity to explore new ideas and new worlds through television, online and community-based programs. For more information on specific PBS KIDS programs supporting literacy, science, math and more, visit PBS.org/pressroom. Follow PBS KIDS on Twitter and Facebook.